Create and display subliminal messages. Is there a better alternative to SubliMessages? Is SubliMessages really the best app in Personal Info Managers category? Will SubliMessages work good on macOS 10.13.4? SubliMessages is a new kind of software allowing subliminal messages creation and display. These subliminal messages will allow you to reach your personal goals quickly and efficiently in order to change your life deeply (motivation, self confidence, emotions and stress control). Use the embedded suggestions or create your own with SubliMessages. SubliMessages is user friendly and so not intrusive that you will forget its presence. you can use it at home or at work without noticing it or being disturbed. Moreover, you can enable or disable it when you want. Bug fix : problem when adding new messages is solved. 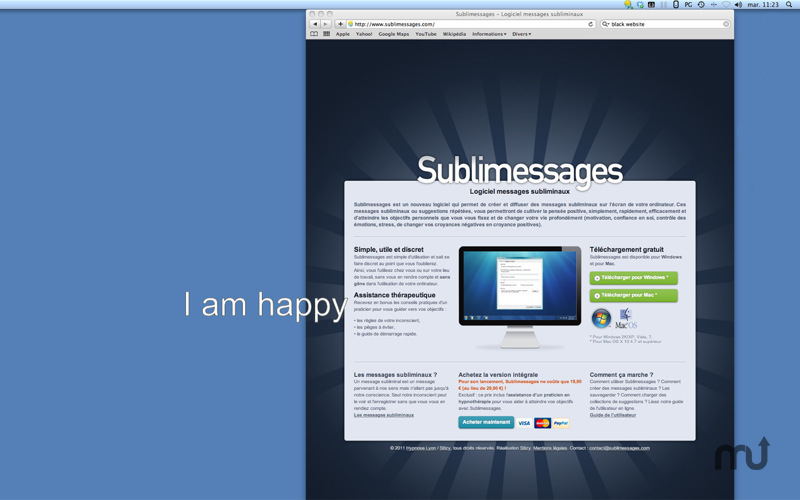 Evolution : you can select the desired used font in SubliMessages option. You can select the font you want to use (it can be any font installed on your system) and its attributes (text color, underline, etc...). This helps to display messages in another character set than the latin one.